"It's an incredible day," said Mignon. "A celebration. A culmination of a dream." A dream that Clyburn says came true through hard work. She spent 14 years as publisher and editor of a weekly newspaper. 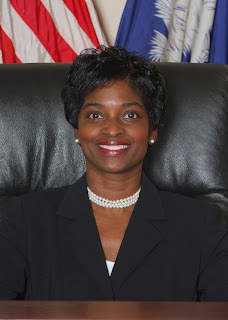 Outgoing South Carolina Public Service Commissioner Mignon L. Clyburn was sworn in as a FCC (Federal Communications Commission) Commissioner today in a formal ceremony conducted by Senior Judge Matthew J. Perry, Jr. at the Matthew J. Perry, Jr. Courthouse in Columbia. Clyburn will be the first African American woman and first South Carolinian ever to serve as an FCC Commissioner. Clyburn is the daughter of House Majority Whip James Clyburn (D-SC) and former head of the Congressional Black Caucus. She previously published a weekly newspaper in Charleston, SC, before serving on the South Carolina Public Service Commission for six years. She has also chaired the Washington Action Committee of the National Association of Regulatory Utility Commissioners.